Roger Federer says he hopes he has not missed his last chance to play Rafael Nadal after the Spaniard withdrew from their Indian Wells semi-final with a right knee injury. 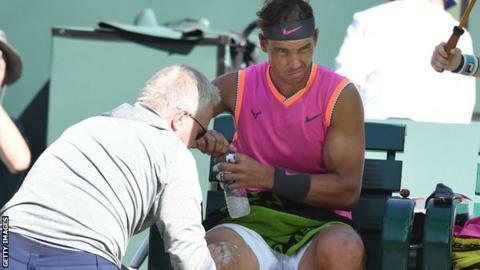 Second seed Nadal received treatment to the knee during his quarter-final win over Karen Khachanov on Friday. The Spaniard had a brief practice session on Saturday before withdrawing. "It's tough for me to accept all these things that I'm going through in my career," Nadal said. Swiss Federer received a walkover to Sunday's final, where he will face Dominic Thiem after the Austrian beat Canada's Milos Raonic 7-6 (7-3) 6-7 (3-7) 6-4. "I am obviously excited to be in the finals, but not this way," Federer, 37, said. "We've had so many epic battles and I know now that every one we have could be our last. Was this our last chance? I hope not." Nadal said: "My goal is to be healthy as many weeks as possible to keep playing and at the highest level possible. "Sometimes I feel sad because I'm in a disadvantage to all my opponents." The 32-year-old also withdrew from next week's Masters 1000 event in Miami with the injury. Nadal and Federer, who have 37 Grand Slam titles between them, have not played each other since 2017. Nadal leads the head-to-head 23-15 but Federer has won their past five matches. Nadal completed just one hard-court tournament in 2018 - the Rogers Cup in Canada, which he won - because of his injury struggles. He was forced to retire from his Australian Open quarter-final in January 2018 and again during the semi-finals of the US Open. Nadal reached the final of this year's Australian Open, where he was beaten in straight sets by Novak Djokovic. "I warmed up today and I felt that my knee was not good to compete at the level I needed," the 32-year-old said. "I'm just going to keep doing the things that work well for me and accepting that sometimes these issues can happen. "All the things that are in my hands, I am doing well. The things that I can't control, I can't control." The Spaniard added he was confident he would be fit for the Monte Carlo Masters in April, which is one of the first events of the clay-court season. It would have been the 39th time Nadal and Federer had played one another and the fourth time in Indian Wells. They last met in the final of the Shanghai Masters two years ago, which Federer won 6-4 6-3. Speaking to reporters after his 7-6 (7-2) 7-6 (7-2) victory over Russia's Khachanov, Nadal said he "could not guarantee how I'm going to wake up tomorrow". "I love to play on hard, but probably my body doesn't love it that much," he added. "My feeling is there are a lot of players that love to play on hard, true, but their bodies don't love to play on hard, either." "I'm just going to keep going," Nadal said after this latest hard-court setback. He say he will continue to adjust his calendar - but hard-court tournaments will remain on the schedule. In reality, he has little choice, with half of the Grand Slams contested on that surface. Nadal had hinted earlier in the week that he may skip Miami anyway, and perhaps his participation in the hard-court events which follow the US Open will be scrutinised even more closely. He often has to miss them anyway. In 17 hard-court events from the start of 2018, Nadal has withdrawn from 11, retired from three and completed just three.